Learning how to get ready and be efficient for a backcountry day can be daunting for many aspiring backcountry enthusiasts. I am still working on my systems and I have been backcountry skiing for over 10 years. It takes many hours frigging with gear and getting your skins stuck in your hair while they flap about in the wind to get it right. There is a lot of technique involved in outdoor expeditions on skis, but a lot of guess work can be eliminated by bringing good gear that has a reputation for holding up in stressful situations. 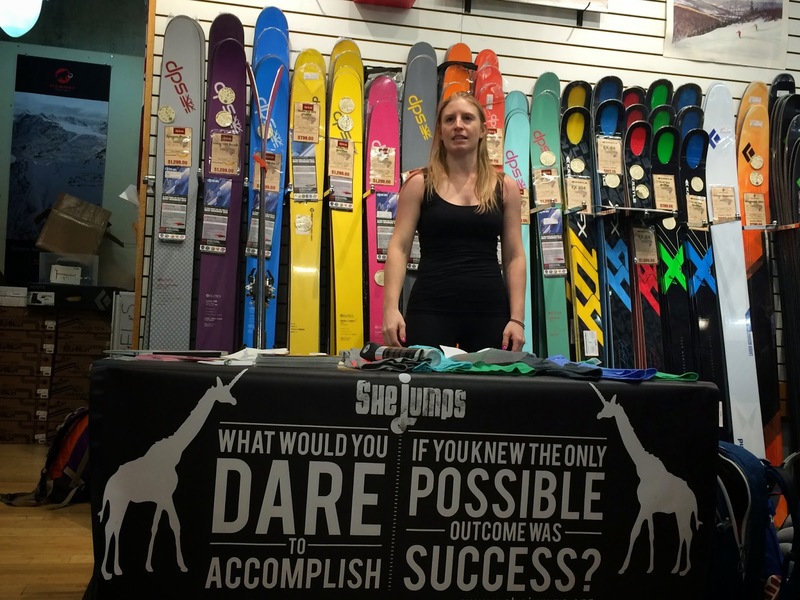 For this reason, SheJumps, the nonprofit that is dedicated to getting women active in the outdoors, decided to host an event focused on helping people (and specifically women) prepare for backcountry skiing. 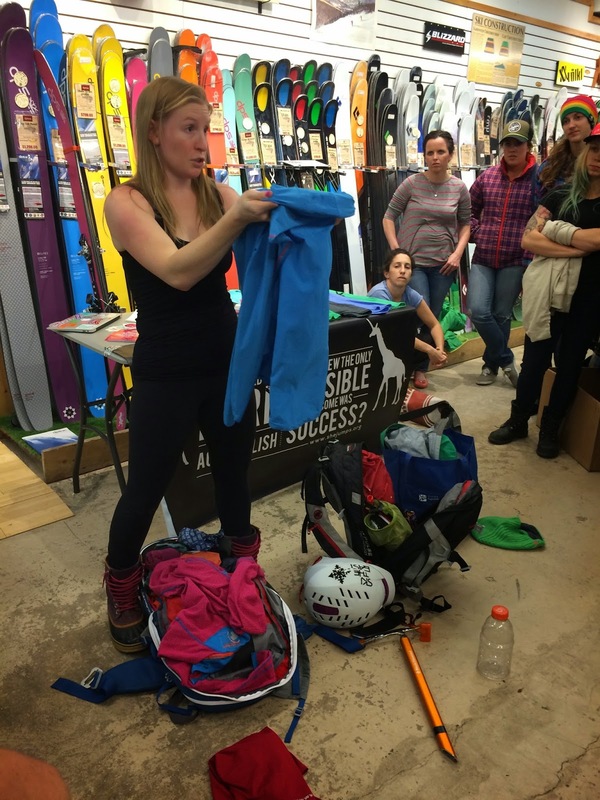 I agreed to Emcee the event and show the women of Burlington what I have over time decided are the most important things to bring into the backcountry with me. 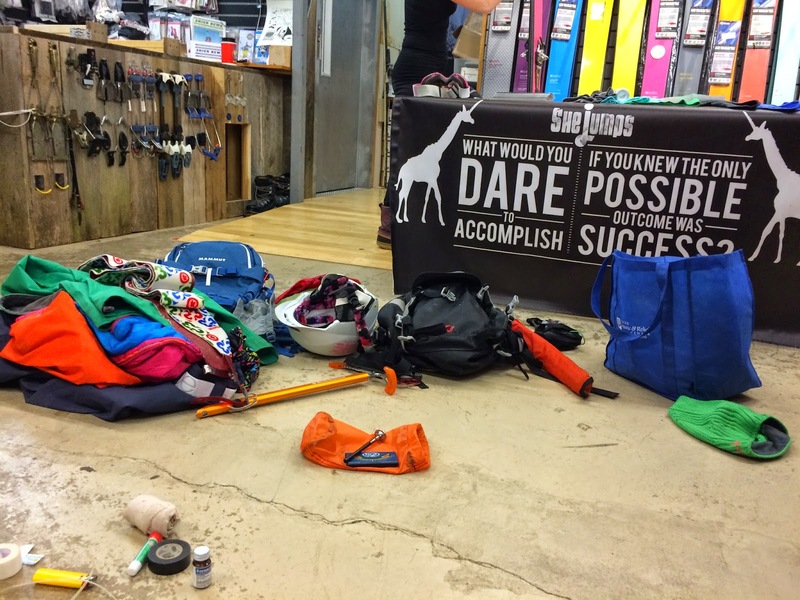 The event was held at the Outdoor Gear Exchange in Burlington, which is one of the largest retailers of backcountry gear on the eastern seaboard, and my hope was that if there was anything that people needed they were in the right spot to do some one-stop shopping. I began by talking about my Mammut layers, starting with my light weight Niva 3L Jacket which I adore and my Mittellegi Pro Pants/SunridgeGTX Pro 3L Bib Pants. I love these layers because they are technically hard-shells but they are soft to the touch and don’t crinkle. I talked about how it is important to have a good layering system and went on to discuss the Pike Hoody and the Biwak Light Jacket that are perfect for layering under shells. I love the Pike for colder weather because of the hood and the Biwak for warmer weather because of the stretch material under the armpits to let my core breathe a bit more. Once I had covered the basics of dressing appropriately, I moved on to some of the other items that I bring along. Food was an important subject for women, as they tend to have sugar swings more easily when they work out. I mentioned bringing things that are very exciting to eat so that you are more motivated to eat even if it is brutally cold out (I like roasted chicken, cheese, and salami). I also talked about lightweight bottle options such as reused Gatorade bottles instead of heavy metal bottles most people drag around with them. When it comes to food, it is very personal, but you must be introspective and know your eating habits so that you can plan accordingly. It is your own fault it you run out of energy because you packed food poorly. No one else in a group deserves to deal with your onset of “hanger” (hunger-anger). For the med-kit portion of the talk I discussed everything from zip-ties to blister patches and mentioned that you can never be too careful with blisters and should bring enough patches for both sides of your heels for every day you are planning to go out. Getting bad blisters will happen and it is usually a day-ender if you are not prepared and proactive. Finally I touched on the subject of safety, and while this was not the focus of the talk, it is always important. Here on the east coast it is easy to get lulled into a sense of security when it comes to avalanches, but we do have them here and as an ice climber friend once told me, “safety never takes a vacation.” I carry my Mammut RAS airbag with me to Mt. Washington, to the Chic Chocs, and even sometimes just to Stowe, Jay, and Killington. Our snowpack can be terrible here in the east and it is good to be prepared. The Element Beacon made by Mammut is amazing and I talked about how having that in a quiver is not an option. The multiple burial search works great and you can find people lickety-split. Digging people out takes a lot of practice but buying a great, efficient beacon saves a huge amount of time as well. What I was left thinking about after the event was how hard it can be to break into a new sport when there is so much information to disseminate. 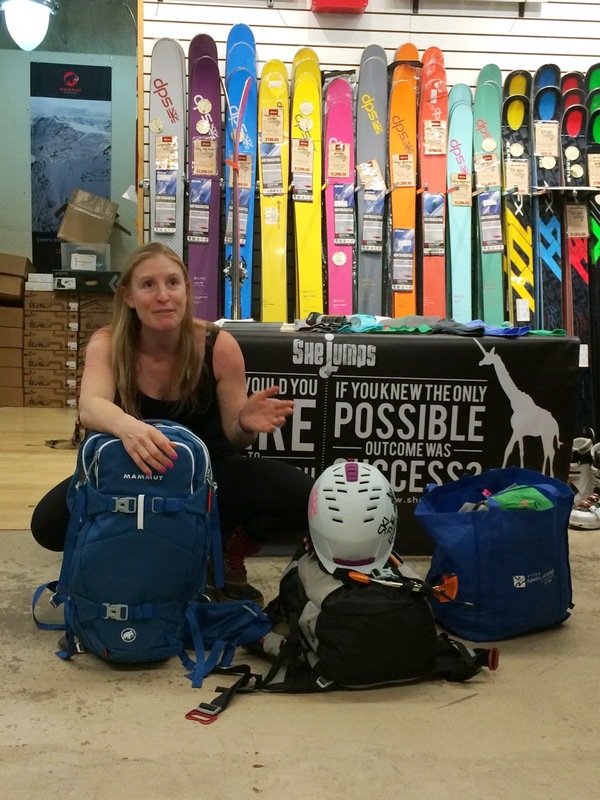 From avy gear to skins, the weight of each purchase choice you make can be daunting, but it was my hope that I helped a few women at least make some decisions about what to bring with them that will make it a more pleasant experience. Eventually we all have our systems, but as more women get into backcountry travel, it is good to keep an open discussion going about tips and tricks because the outdoors is a wonderful place to explore and it does not have to be cold and miserable. It can be a place of mediation and joy if you are not stressing about the small stuff. A special thanks to Megan Davin from SheJumps for the lovely photos.